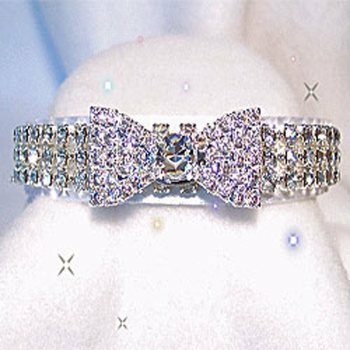 This 5/8" white diamonds bowtie collar has a beautiful white roses ribbon attached to the collar or the blue with white diamonds comes on a solid blue collar. The rhinestones are all Swarovski crystals set in sterling silver plated prongs. This designer dog collar would be perfect for a wedding or any special or formal occasion photo. Just Beautiful!